I have a new keyboard! Whee! My new keyboard is here! And I’m in love with it. I’ve been using the Microsoft Natural ergonomic keyboard for a few years, and this is the newest incarnation. 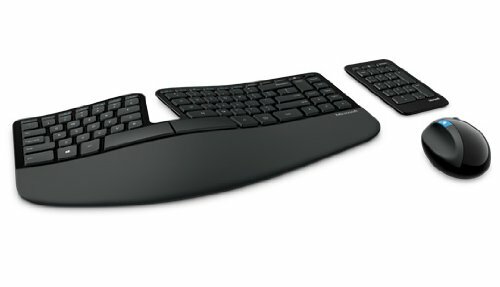 It’s the Microsoft Sculpt ergonomic keyboard. The old keyboard was so chunky. It drove me nuts not being able to push my keyboard tray under my desk. This new one is slim and cool-looking. But the best part is…the magnets! The battery compartments are magnetized so the back snaps right on. (Keyboard and mouse.) The base to elevate the keyboard is also magnetic. Obviously, I have a thing for magnets. But I also happen to think it’s pretty damn cool.